Question: Which of these things is not like the others? 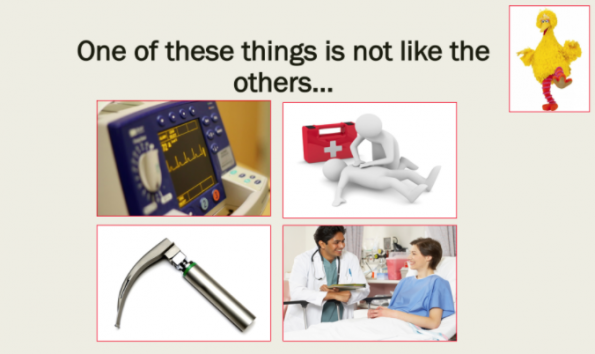 Answer: This is a TRICK QUESTION… all of these components are equally important to Emergency Department (ED) care! PART 1: Background Knowledge − Why Does Patient Experience Matter? What do the Domains of Quality mean? Although the definitions of the domains of quality are broad, they are supposed to provide us with an overall direction in which we need to steer our health care. Our province is prioritizing patient-centeredness as one of the key areas where we need to focus on improving the quality of our care. 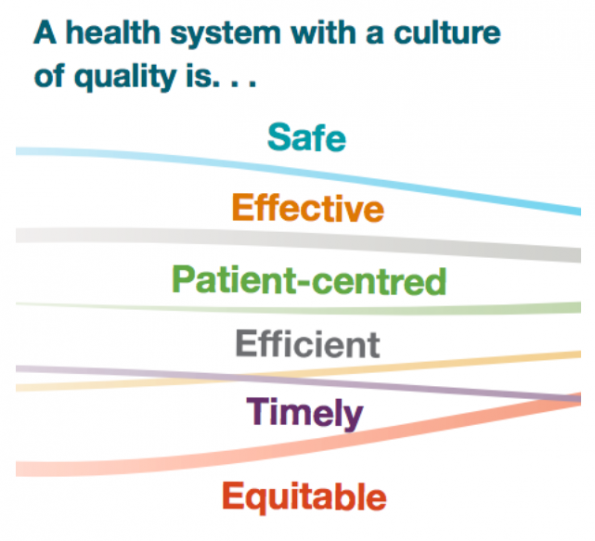 …but as front line clinicians, why should WE pursue improvement of patient experience? In 2013, a systemic review by Doyle et al. showed that there is a link between patient experience, clinical safety, and effectiveness across a wide range of disease areas, study designs, settings, populations, and outcome measures. (10) This study helped to justify that patient experience is an important pillar of quality and that focusing on improving patient experience will increase the likelihood of improvements in patient safety and clinical effectiveness. PART 2: What are Patients Really Looking for? Examples of initiatives that improve timeliness of care in our ED include the rapid assessment zone and matching our shifts with peak patient volumes. This is an area where we can easily use our ultrasound training to impact our patient experience when clinically indicated! Pain is a major symptom for which patients seek out emergency care. Advanced pain directives at triage as well as standardized order sets (e.g. a renal colic protocol) help with quick symptom relief. Information dispensation is correlated with improved patient satisfaction. Overall, what patients want seems pretty simple. They want empathy, timely care, competent physicians, pain relief, and information about their visit. 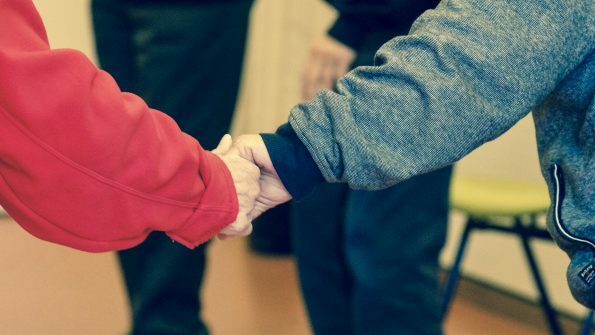 I believe that we have the tools to cater to these issues without making drastic changes to the way we practice, and more importantly, these are components of care that we would all want for our loved ones. Appropriately, in our EDs we prioritize care for the sickest patients. However, when we find ourselves not taking care of sick patients as often as we think or hope, this leads to cognitive dissonance in our job. 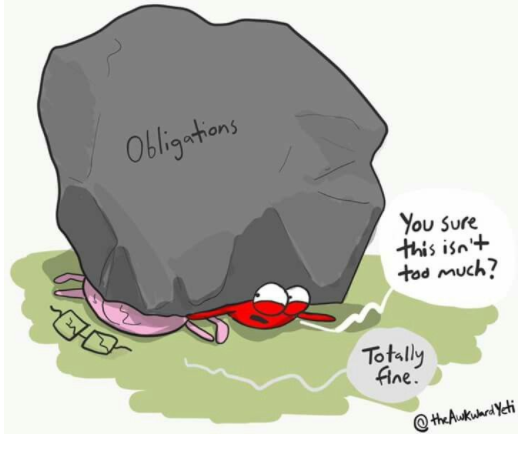 Furthermore, we get frustrated with patients presenting with non-urgent complaints who then become frustrated or demanding with their patient experience. Recent data from our ED shows that the percentage of CTAS 1 patients seen at TOH is under 1.5%. In contrast, the majority of our visits are CTAS 2-4. This data highlights the reality of the patient population we treat in our workplace. Although we must be excellent at resuscitation, the majority of our bread and butter patient volume is NOT resuscitation. We are first and foremost generalists who provide care to all types of patients at all times of the day. If we can understand that this is our reality, we can embrace it and not become frustrated with the less acute patients who want a positive experience when they present to our ED. Another area where many clinicians may feel frustrated is the idea of forced or scripted ways to ensure empathy. The area of scripting has shown promise in improving the communication and interpersonal interaction of encounters with patients. (8) However, many find this awkward and cumbersome, which leads to feeling less empathetic towards patients. After all, don’t we all already have empathy for our patients and that is why we became physicians? The most common dialogue to convey empathy is AIDET, which stands for acknowledge, introduce, duration, explanation, and thank you. 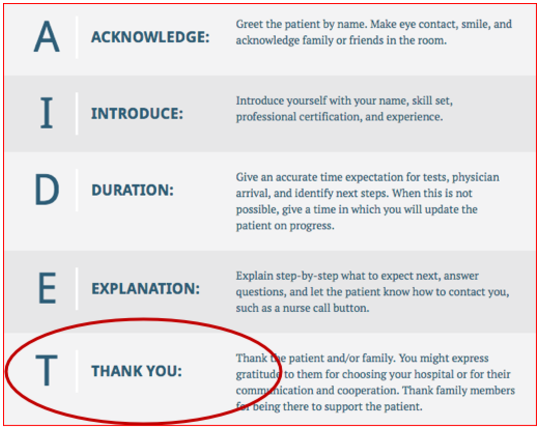 (19) Most Canadian ED Physicians find this model challenging, particularly because of the THANK YOU component that seems to fit more of an American customer service model. Sometimes we just don’t want to thank patients for coming. Being forced to say things that make us feel unnatural can bring us to resent the importance of patient experience. The final complaint clinicians often have with patient experience is the way that it is measured. Though understanding patient perceptions can guide opportunities for improvement, patient satisfaction is often measured using survey techniques and is inherently subjective. Thus, a patient can receive the standard of care but still rate their experience as poor. Furthermore, hospitals use standardized validated questionnaires to measure patient satisfaction and these questions sometimes do not have enough granularity to elucidate what is influencing satisfaction. Finally, hospitals receive survey results monthly, which may not be frequent enough to know if initiatives are directly impacting patient experience. For example, if you were trying to lose weight and wanted to understand if the changes in your diet were making a difference, you would weigh yourself more than 12 times a year because data drives change. Firstly, our reality is that many of the patients we treat aren’t high acuity BUT we are experts at providing care for patients with all types of presentations who are sick, injured, and scared, and may have nowhere else to turn. I do not recommend we script our patient encounters or thank patients for every visit, but I do think that we can incorporate parts of AIDET into our daily practice and at least remember to introduce ourselves to patients and explain the next steps in their emergency visit. Finally, patient satisfaction scores are subjective and can be frustrating. When measuring patient satisfaction, perhaps we should consider conducting town hall meetings with patients and other stake-holders actively involved. We should also consider re-thinking the frequency at which we obtain patient experience data. 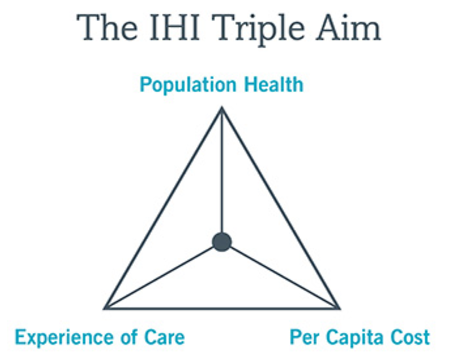 However, after the Triple Aim became popular, it became evident that hospitals that had adopted the Triple Aim as their organization’s framework were seeing that the work of clinical staff was becoming increasingly stressful and this was affecting their ability to actually carry out the Triple Aim. (20) From this came the publication of a new concept called the quadruple aim, which incorporates provider wellness. A systematic review by Hall et al. (2016) looked at the impact of well-being and burnout on patient safety. (21) Of the studies that evaluated well-being, 16 studies found that poor well-being of staff had a correlation with worse patient safety. Furthermore, of the studies that looked at burnout, 21 studies found that high burnout was associated with worse patient safety. These studies highlighted that burnout does not only impact patient experience but also patient safety such as through medical errors. (21) This review illustrates the need for healthcare organizations to consider improving employee wellness/burnout to create a safer work environment and improve patient safety. How can we be well in our increasingly stressful jobs? Our ED is busier than ever and, according to hospital data, getting busier each year. Unfortunately, sometimes this leads us to feeling like we are not making progress in our jobs. (22) When we arrive to our shift with 25 patients waiting to be seen in the waiting room and leave with the same number of patients in the waiting room, we experience job frustration. There is no easy answer to how we can make our jobs more joyful. This needs to be tackled from many different angles. There are individual and interpersonal as well as departmental and organizational things that can be done to improve provider wellness. Am I treated with dignity and respect? Do I have the things I need so I can make a contribution that gives meaning to my life? E.g. Windsor Regional Hospital instituted an unlimited vacation policy for non-unionized employees in 2014. Employees could take as much vacation as they wanted but it still needed to be approved by their supervisor and when they took vacation, they had to cover for one another. Provider wellness and burnout impacts patient experience and safety. The ED environment can make it difficult to achieve progress in our daily work. We must continue to pursue innovative individual and organizational strategies that make provider wellness a priority. When developing how we can optimize patient experience in our ED, looking to other centers can give us ideas and indications of what is possible. Like the ICU, the Emergency Department is a fast-paced environment and our nurses are extremely busy. Perhaps patient and family involvement menus could help families feel engaged and also manage our nursing workload? 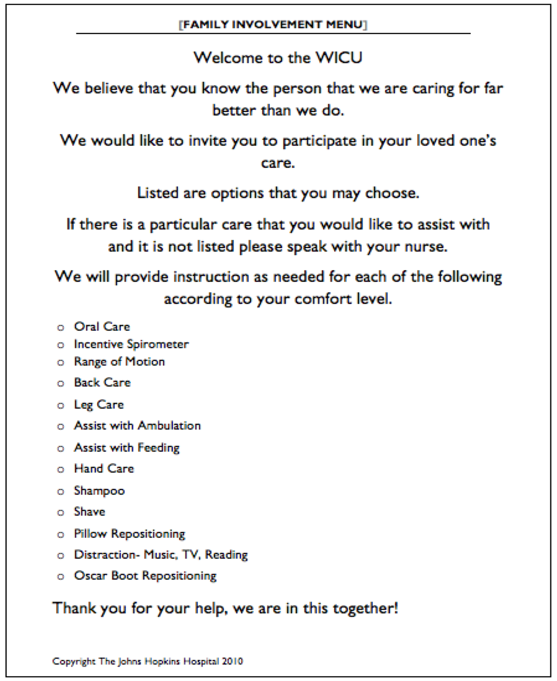 Consider what a Family Involvement Menu could look like in the Emergency Department; we could give families and caregivers a list of things they could help us with such as walking their family members to the bathroom, providing their family members with bed pans, and getting their family food or blankets. Involving patients in the co-design of care processes may improve quality outcomes. Consider involving patients in the design, implementation, and evaluation of ED quality initiatives. Patients and Family members may be a resource. Consider involving patients and family members in providing basic needs for our patients in the ED. Association OH. Leading Practices in Emergency Department Patient Experience Prepared for the Ontario Hospital Association by InfoFinders. 2011. Crossing the Quality Chasm. 2000. p. 23–56. Health Quality Ontario. Quality improvement plan (QIP): Guidance document for Ontario’s health care organizations. 2015;(November):1–21. Boudreaux ED, Cruz BL, Baumann BM. The Use of Performance Improvement Methods to Enhance Emergency Department Patient Satisfaction in the United States: A Critical Review of the Literature and Suggestions for Future Research. Acad Emerg Med. 2006;13(7):795–802. Krishel S, Baraff LJ. Effect of emergency department information on patient satisfaction. Ann Emerg Med [Internet]. 1993;22(3):568–72. Welch SJ. Twenty Years of Patient Satisfaction Research Applied to the Emergency Department: A Qualitative Review. Am J Med Qual. 2010;25(1):64–72. Vincent C, Phillips A, Young M. Why do people sue doctors? A study of patients and relatives taking legal action. Lancet. 1994;343(8913):1609–13. Emergency department complaints one year analysis. Ann Emerg Med. 1987;16: 857-861. Boudreaux ED, O’Hea EL. Patient satisfaction in the Emergency Department: A review of the literature and implications for practice. J Emerg Med. 2004 Jan;26(1):13–26. Thompson DA, Yarnold PR, Williams DR, Adams SL. Effects of actual waiting time, perceived waiting time, information delivery, and expressive quality on patient satisfaction in the Emergency Department. Ann Emerg Med. 1996 Dec;28(6):657–65. Dickson D, Ford R, Laval B. Managing Real and Virtual Waits in Hospitality and Service Organizations. Cornell Hotel Restaur Adm Q. 2005;46(1):52–68. Durston W, Carl ML, Guerra W. Patient satisfaction and diagnostic accuracy with ultrasound by emergency physicians. Am J Emerg Med. 1999;17(7):642–6. Yanuka M. Soffer D, Halpern P. An interventional study to improve the quality of analgesia in the emergency deparment. CJEM. 2008; 10 (5):435-439. Thompson DA, Yarnold PR, Adams SL, Spacone AB. How accurate are waiting time perceptions of patients in the emergency department? Ann Emerg Med. 1996;28(6):652–6. Calder-Sprackman S, Kwok E, Bradley R, Landreville J, Calder L. (2016, June). What do patients want when it comes to publishing ED wait times? A Mixed -Methods Needs Assessment. 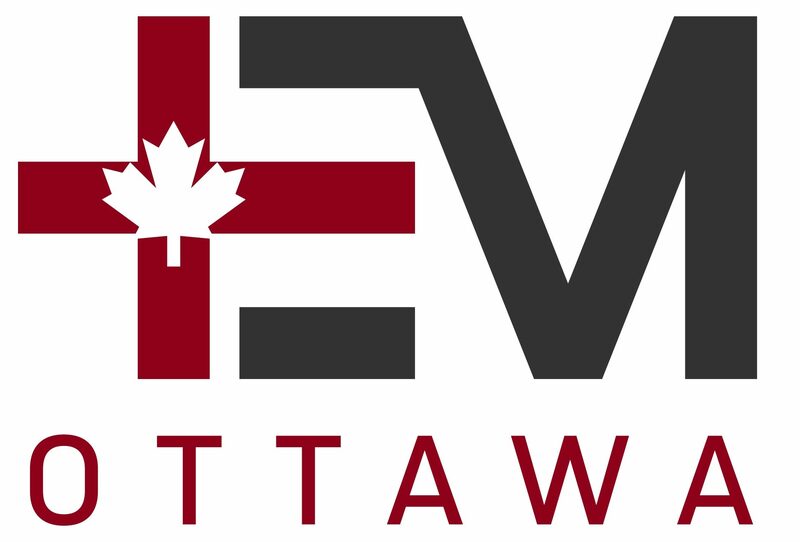 Poster session presented at the Annual Canadian Association of Emergency Medicine Conference. Quebec, Qc. Bodenheimer T, Sinsky C. From Triple to Quadruple Aim Care of the Patient. Ann Fam Med. 2014;12 (6): 573–6. Hall LH, Johnson J, Watt I, Tsipa A, O’Connor DB. Healthcare staff wellbeing, burnout, and patient safety: A systematic review. PLoS One. 2016;11(7):1–12. 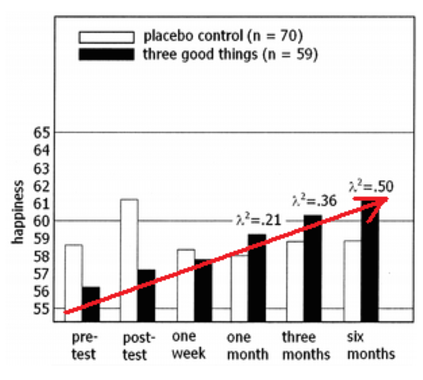 Seligman MEP, Steen TA, Park N, Peterson C. Positive Psychology Progress: Empirical Validation of Interventions. Am Psychol. 2005;60(5):410–21. Kolesar PJ. Vision, Values, Milestones: Paul O’Neill Starts Total Quality at Alcoa. Calif Manage Rev. 1993;35(3):133–65. CBC News. Windsor Regional Hospital’s unlimited vacation called a success. Sept 29, 2014. Coulter A. Patient Engagement—What Works? J Ambul Care Manage. 2012;35(2):80–9. Bate P, Robert G. Experience-based design: from redesigning the system around the patient to co-designing services with the patient. Qual Saf Heal Care. 2006;15(5):307–10. Baker GR, Fancott C, Judd M, OConnor P. Expanding patient engagement in quality improvement and health system redesign: Three Canadian case studies. Healthc Manag Forum. 2016;29(5):176–82. 29. Wyskiel RM, Chang BH, Alday AA, Thompson DA, Rosen MA, Dietz AS, et al. Towards Expanding the Acute Care Team: Learning How to Involve Families in Care Processes. Fam Syst Heal. 2015;33(3):242–9.